Have you ever shown up to Sunday brunch still smelling of Saturday night? Chosen bed, Netflix and pizza over human contact? Stayed in your mould-ridden flat because it's cheap? Meet your spirit animal, Ellie Knight. Her life isn't turning out exactly as she planned. She hates her job, her friends are coupling up and settling down, and her flatmates are just plain weird.Some people might say she's a hot mess but who really has their sh*t together anyway? 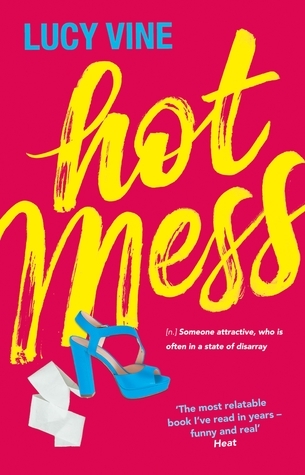 Hot Mess was a witty and sharp book, and it has been hailed to be the next Bridget Jones. In many areas of the novel, I did enjoy reading Vine's writing, but in others...not so much. In Vine's novel, we follow the story of Ellie, who is twenty-nine and is single. Like many people, she has her fair share of family drama and a handful of bad dates. What I thought was particularly interesting is that Vine clearly highlights the pressures of modern dating, and I did enjoy seeing how these pressures affect the protagonist. Ellie is a funny character, even quite sassy at times, and this does make her strong and well-written, however, she can get very whiny at times which did get annoying, and on some occasions, I felt that Ellie was more of a teenager than an actual adult. But, generally, Ellie was a good character. Although, I would've liked to have known more about the protagonist, as the majority of Vine's novel was mainly focused on Ellie disliking her job, her flat and most of her dates - however reading through Ellie's dates did make me giggle occasionally. Hot Mess does have an interesting set of characters, and for some of the characters, I thought that their relationship with the protagonist was fantastically written - but I do have to admit that some things between certain characters were quite predictable and it did ruin the surprise when these things actually happened. The plot was okay to read, in many areas I was totally gripped, and Vine does do a good job of building a connection with the reader. Although, there are certain parts of Hot Mess which I feel didn't really add to the plot and was therefore not really necessary to include - I feel that these parts were added to pad out the chapter length. But what was really great about Hot Mess is the writing style that Vine presents. Vine does do a great job of pulling you in from the first page, and she does keep you engaged for the whole novel. I also really loved how Vine kept her main message all the way from start to finish, and that really helped with leaving a strong impact by the end of the novel. If you love reading about disaster dates, or you're just looking for a comedy chick-fit - Hot Mess is something for you. The last Geek Girl book is here, and whilst I am sad that I have to say goodbye to Harriet and her crazy gang of friends, I am so, so happy that such a perfect series had the most amazing ending. The closer I got to the end, the more I started to cry and by the time I had actually finished Forever Geek, I was holding the book to my chest sobbing. Yet again, I am blown away by Smale's brilliant and witty writing, it's incredibly engaging and I have loved every moment of reading her novels. I loved the sense of adventure in this novel and the mishaps that Harriet went through. I certainly think that Harriet was at her best here in the novel, and even know she's still the same awkward self-centred girl I've grown to love more with each novel, she really came out of her shell in Forever Geek. Smale did a phenomenal job with really making the reader click with Harriet in this fantastic last novel, and I felt like I've known her my entire life from this one book. It was also really great to see some of the old characters that I haven't seen for a while, especially Wilbur, who, as well all know, is my spirit animal (I'm not joking, I love him that much - he's such a well-written character who is always so full of charm and wit). I think Smale did a great job of allowing the characters who were featured more in the last book to step out of the spotlight for the majority of the novel and allow the old-timers to step in. I've said this before and I'll say this again, but I have never connected more to a character than I have with the one and only Harriet Manners. Smale has done a fantastic job with presenting Harriet as a genuine teenage girl who everyone can find some connection with. I'm really going to miss her. I think it's fairly obvious to say that I swallowed every page of this book, and as hard as I tried, I still managed to finish this novel within several hours because I could not put Forever Geek down. This is a real page-turner, and, in fact, the same can be said for the rest of the series. The plot to this Geek Girl novel was at its finest, the plot twists (the majority of which did make me tear up) and the way it was drawn to a close was phenomenal. I don't think I could imagine a different ending to the book and to the series. Smale did a great job of making sure the main cast of characters got what they needed in the end. If you're looking for a book that has comedy written all over it, with romance, sadness and laughter too - this is the one for you. 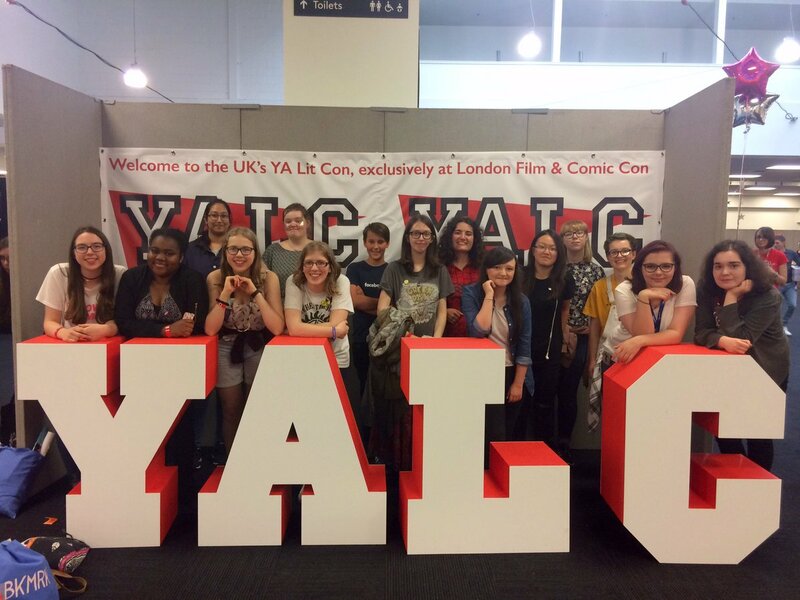 Last weekend was the Young Author Literature Convention, or otherwise known as YALC, which is held annually at London Olympia by London Film and Comic Con. It is a huge book event where publishers, authors, agents, bloggers and book enthusiasts go to, where there are talks, signings and stalls where you can buy and get free things. If you've never gone before, I recommend that you do, it is such a great place to meet people, and even your favourite author(s). I got to Olympia at around 09:30am, but I had to queue for a bit to get in and then I had a little trouble actually getting into the event. So, annoyingly, I had to miss the majority of my the panel I wanted to go to because I had a little bit of trouble getting into the venue, so I queued super early for Holly Smale as I had several of her Geek Girl novels to sign. I then had a lovely chat with one of the girls in front of me about how feminism shouldn't be seen in a negative way (I honestly loved this girl for her views and opinions about this topic), before having a small emotional meet with Smale as she recently published the last novel in the Geek Girl series (boo). After that, I *FINALLY* met Holly who I've known for five years on the internet. It was a bit emotional, I must say (there was a lot of hugging). I then met up with Amber (you can watch her vlog of the day here), who I met in person two years ago at the 2015 YALC and have known for roughly the same amount of time as Holly in the interweb. I was also introduced to the lovely Lottie (you can watch her vlog here) and Hannah, who were awesome to be around for the day. After a few hours of meeting each other, Amber and Lottie got 'married' at the Stripes Publishing stand, and so did Holly and I. We then ran all over the place because publishers were doing 'proof drops', but we didn't arrive in time for most of them (I think we were all disappointed about missing out on the Stephanie Perkins' proof drop, we exercised for no reason). I was persuaded to vlog by both Amber and Lottie, and then I found out that my phone doesn't record videos for very long (my phone clearly hates me). We went to every stall quite a few times, entering competitions (I won a silver quill pen thing from Fairyloot) and picking up A LOT of free things, little snippets of new books, fans (it was v hot), food and thankfully a tote bag from BKMK for me to put everything in because there was no way in hell that I was going to be able to fit everything into my 'lil rucksack. Late afternoon was the first ever Teen Blogger meet up, which was AMAZING! We all helped to produce this video for Jack (in Amber's words, "he isn't dead"), who is one of the moderators for Teen Bloggers, as he couldn't make it to YALC. It was great to meet other teen bloggers, everybody was so nice! As soon as the meet ended, I rushed off to get my copy of We Were Liars signed by E Lockhart, which is one of my favourite novels of all time (and the most re-read), as well as my copy of Frail Human Heart by Zoe Marriott. Thankfully there wasn't a queue for them as they were at the end of their signings (I really hate queuing). I am now the proud owner of a signed copy of We Were Liars. I don't think you understand how happy I am about that. I also met the amazing Grace Latter, who is one of my favourite bloggers ever. I'd be lying if I said I didn't fangirl when I met her. She was so kind and lovely and if you haven't read her blog, I recommend you do! I was exhausted by the time I got home, my shoulders hurt and all I wanted to have was an early night (I'm a little old lady trapped in a teenager's body, okay?). Honestly, the day was fantastic, it was great to catch up with old friends and meeting new ones, talking to publishers and getting my books signed. I'm looking forward to next year! "How do you know who to trust when you can’t eventrust yourself? One of them says FLORA BE BRAVE." Flora has anterograde amnesia. She can't remember anything day-to-day: the joke her friend made, the instructions her parents gave her, how old she is. Then she kisses someone she shouldn't, and the next day she remembers it. It's the first time she's remembered anything since she was ten. But the boy is gone. As soon as I saw the trailer for this novel, I knew that I had to go and read it, and reading the blurb only cemented this urge. Barr's novel had a really interesting take on amnesia, and this really gave The One Memory of Flora Banks a very 'Memento' kind of feeling, and with Barr's sharp and intelligent writing, it created a compelling read. 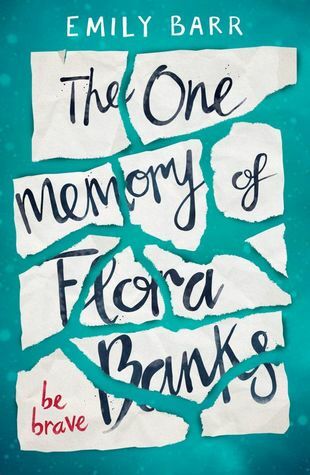 The main storyline of The One Memory of Flora Banks follows the life of Flora, a seventeen-year-old who suffers from anterograde amnesia, which means that she does not have the ability to create any short-term memories (are you getting those 'Memento' feels yet?). But when she kisses a boy at a party and remembers it the next day, Flora's life goes from cosy and comfortable in the eyes of her controlling parents to adventurous and daring. At first, I had really enjoyed the plot of Barr's novel because I wanted to know everything. And I mean everything. Why does Flora have amnesia? How did Flora first cope when she was diagnosed with her condition? How did her family cope? There was so much I needed to know. These questions were answered over the course of the novel, but then more questions arose. But as the plot reached its climax, my love for the story began to weaken. The story started to turn to Flora's obsessive nature about being with this boy, and this started to become annoying in the latter part of the novel. I felt as though Flora thought that this boy could 'cure' her amnesia, and I was so angry at the fact that this cliché was developing. And even though the plot twists generally caught me off guard, I just thought that there were too many events that flat out confused me or annoyed me. I did enjoy the first person account that Barr's novel was set in, I felt as though it gave me more of an insight into Flora's mind as it allowed me to understand her and how her condition affects her. I found Flora to be a brilliant character, she was possibly one the most likeable characters in The One Memory of Flora Banks. However, I was upset that I didn't get to know the other important characters as much as I would have liked to. I would have liked to know more about her parents and the rest of her family, and even Paige, her best friend. I feel like the other characters were drowned out by the obsession Flora had for this boy, and this was such a huge disappointment in the end. Although I did love how the book didn't stick to one genre. I thought the way it moved to thriller, then romance, etc, was well-written and Barr did a fantastic job at transitioning between them. I feel as though I would've enjoyed this book more if some of the other characters were more involved in the plot. Their absence allowed Flora's fixation on this boy to become really obvious and it took over the plot in many areas. My opinion is torn over this novel, in some aspects I really did love it, but in others, I became frustrated and I had to put the book down for a few minutes. But, overall, I am happy with the way it ended, however, I am upset by the fact that I finished this novel with mixed emotions rather than the love I started with. Lilith Shadow, princess of Gehenna, is struggling to conceal her forbidden magical powers from her people. Her only ally is Thorn, ex-outlaw, now a squire at Castle Gloom. Together, they must deal with threats from all sides: zombies roaming the countryside, a troll army descending on the castle, and sinister jewel-spiders kidnapping villagers in the dead of night. If you were a fan of Khan's first novel in this series, Shadowmagic, then you will surely adore the latest instalment to this series. 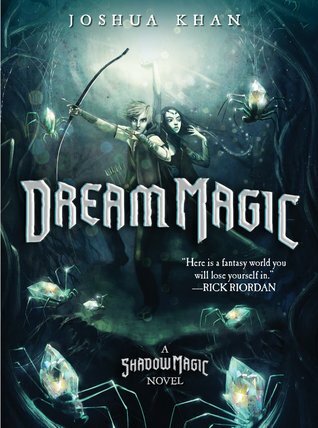 Dream Magic returns readers back to Gehenna, where poor Lilith Shadow simply cannot get a break: she's struggling to hide her powers from the people of her kingdom, has to deal with trolls threatening war, and people are vanishing in the dead of night. The world building in Dream Magic was such a joy to read. I thoroughly liked the imagery created by the author, the small details of the settings added a pleasant touch to the story. I really enjoyed going back into the world that Khan introduced me to in the first novel, It would be an understatement to say that the world in Dream Magic is phenomenal. It was amazing to see the characters back in action. The character development from Shadowmagic to Dream Magic is one of the best that I have seen in a while and my connection with each of the cast for Khan's novel grew from the first time I had met them. These characters have grown stronger without a doubt, and I'm looking forward to seeing how Khan will develop them further in later novels to come. Lilith, the princess of Gehenna, is such a perfect, yet flawed character, and with these elements mixed together creates an altogether beautiful character. Much like with Thorn, I really enjoyed how Khan made me feel as though I was in his shoes for the majority of Dream Magic. The plot was well written, and I'm loving it more than I did with Shadowmagic, which equally had a fantastic plot. Dream Magic's plot is clear, and I could spend all day reading it. I was drawn in by the first chapter, and I was eager to continue reading to see what happens next to the cast of characters. Overall Dream Magic was a joy to read. Khan's second novel in his Shadowmagic series is a definite improvement on what was an already fantastic novel. I'm really anticipating to see what happens next in this series, Khan is a talented author, whose work should be praised. If you are a fan of fantasy, Joshua Khan's Shadowmagic series is not one to miss out on. Many thanks to Faye and Scholastic Books for sending me an advanced copy of Dream Magic, in no way has this affected my opinion of this novel, nor the content of this review. Feminist. Aspiring writer and actress. Lives off drama. Georgia is currently an A Level student trying to get through her courses without having a mental breakdown.